As you may have heard if you are following my Give It 100 video diaries …. today I am going to be sharing about ROSES , RED ROSES. 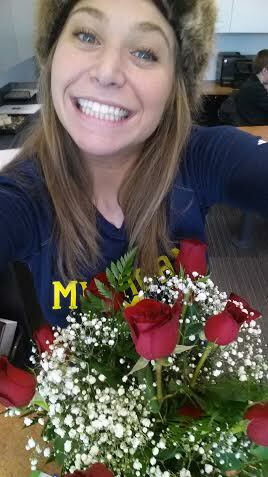 Pictured to the left you can see me smiling with a dozen of red roses sent to me for Valentine’s Day! I was so excited of course to have these with me at my desk ( two days prior to vday) they smell lovely and look pretty like me too !! Rocking a University of Michigan Long sleeve shirt to show some spirit for today’s Basketball Game vs Wisconsin !! Go BLUE !! I have done a little shopping that has been highly influenced by the spirit of red roses & Valentines Day. My standard outfits are more classic and consist of black on black – because that’s what looks hot & sheik ! All Black Everythangggg !! Trying to change it up a bit and be in the holiday spirit I have bought a few items with roses on them ! I purchased a really cute mini-skirt that I will have to post the photo later on … when I wear it in Miami next week 😀 !! But for now i’ll show my snow bunny side , since I do happen to be living in Michigan. 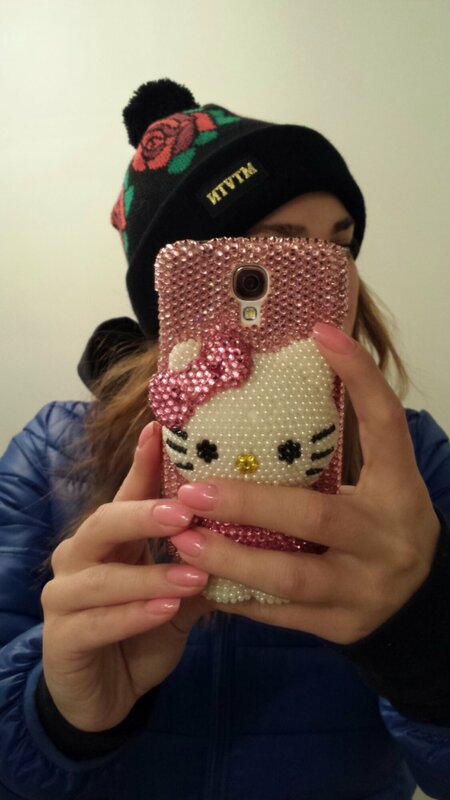 Photo’d to the right you can see me trying on this festive beanie hat with my new Cell Phone Case for my SAMSUNG S4 !! Additionally, you can see the manicure I got for Vday with OPI “I’ve Got A Date To Knight” – the pink nails mentioned in the previous blog post. I’m Obsessedt with HELLO KITTY – my like turned into love in 2011 when I studied abroad in Barcelona, Spain (which I commonly refer to as) BarSHAWLona…. I noticed that Hello Kitty was a familiar face in each of the countries that I traveled too ! She was ubiquitous in Europe !! Hello Kitty is Global Sensation ! If you want to hear more about my feelings on Hello Kitty keep an eye out for my research paper of her to be posted on the blog. FUN FACT: According to the National Retail Federation, 224 million roses are grown for Valentine’s Day, and $1.9 billion is spent on flowers in general. CRAZY !! 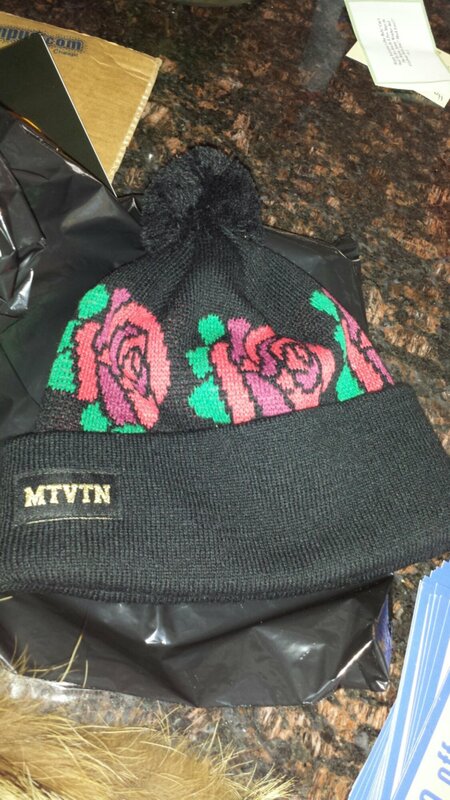 If you are interested in buying this rose beanie with puff ball on top go to Motivation , 1203 S University Ave, Ann Arbor, MI 48104. It is a hat of their own custom line MTVTN for $32 !